Pictured is Susana Cardoso (Director of the Portuguese National Tourist Office in Ireland) with Caitriona Toner from American Airlines. Portugal has been awarded the Best Summer Destination at the 2019 Irish Travel Industry Awards. The Irish Travel Industry Awards, now in their ninth-year, are the premier awards for suppliers and agents in the travel industry in Ireland. The awards were hosted by RTE’s Miriam O’Callaghan, last Thursday 24th January, at the Mansion House in Dublin, and were attended by over 500 travel industry professionals. 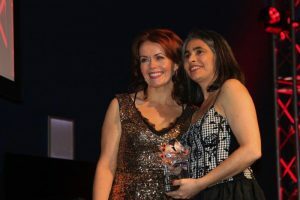 Susana Cardoso, the Director of the Portuguese National Tourist Office in Ireland said, “We would like to thank everybody who voted for us and are delighted to have received this award”. She continued, “Portugal is a beautiful country with historic cities, world-renowned cuisine, natural landscapes, and some of the world’s most spectacular beaches. We are thrilled that it has been named as the best summer destination in 2019”. For more information visit www.visitportugal.com.